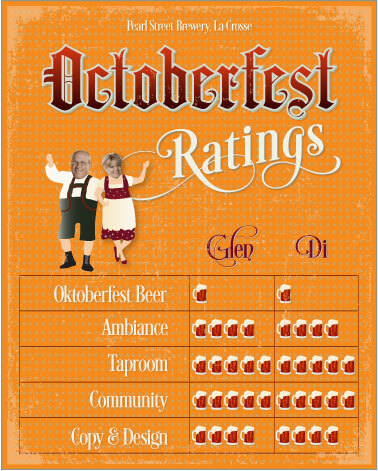 One of the fascinating things about our Octoberfest Beer Tour has been the diversity of breweries. We’ve sampled beer from a boutique 100-barrels-a-year brewed in the Corner Pub’s basement, to the cranked 320,000-barrels-a-year at Minhas‘ updated, multi-structured complex. We found our visit to Pearl Street Brewery on Saint Andrew Street, La Crosse, to be somewhere in the middle of those extremes. More importantly, it sports a logo I just love. If you’re like us, you might find Pearl Street outwardly intimidating when you first manage to find it—a GPS comes in handy for this. Apparently, the brewery originated in a downtown Pearl Street location, thus the name, and later expanded to a space in this old warehouse. Step inside and you’ll feel much more relaxed. 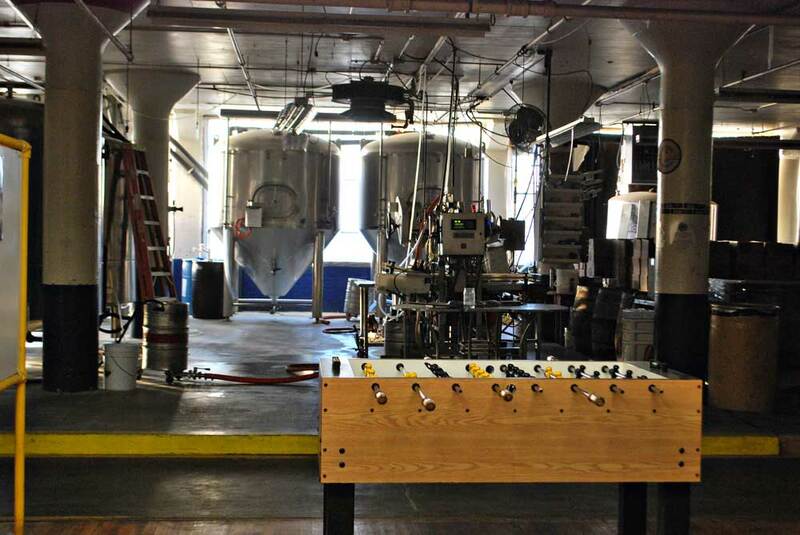 It’s a big, open, no-nonsense, welcoming brewing space. There’s a taproom bar amongst the fermenting vats, along with tables and a funky stage for live music. We stopped by after brewing hours on a quiet Wednesday afternoon, so we missed the Saturday tour. But, hey, we can entertain ourselves. We had fun sipping and browsing on our own. 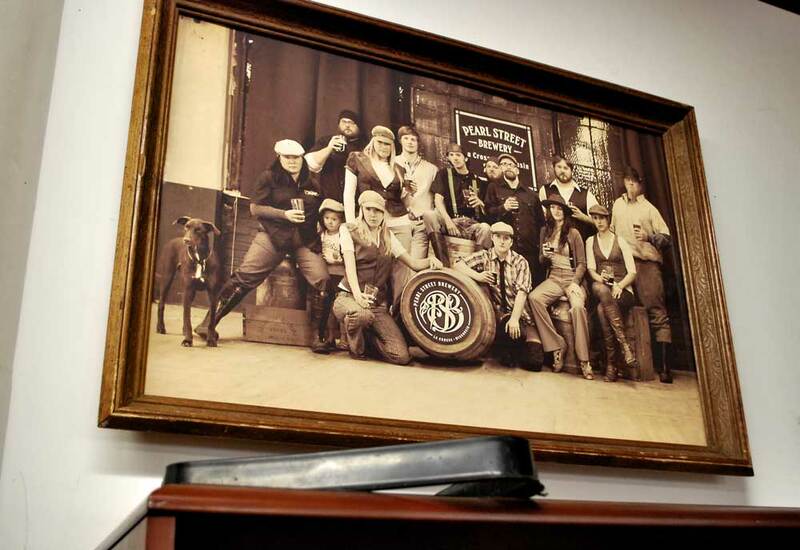 Pearl Street Brewery is my kind of business—homegrown, hardworking and obviously a fun sense of humor. It’s recently expanded its distribution to Minnesota and, interestingly, it has its own Printasaurus Lex, as she’s referred to, designing and producing Pearl Street’s packaging from an in-house print shop. Pearl Street Brewery makes some mighty fine beer! My husband had the Rubber Mills Pils, which brought him smile of pleasure. 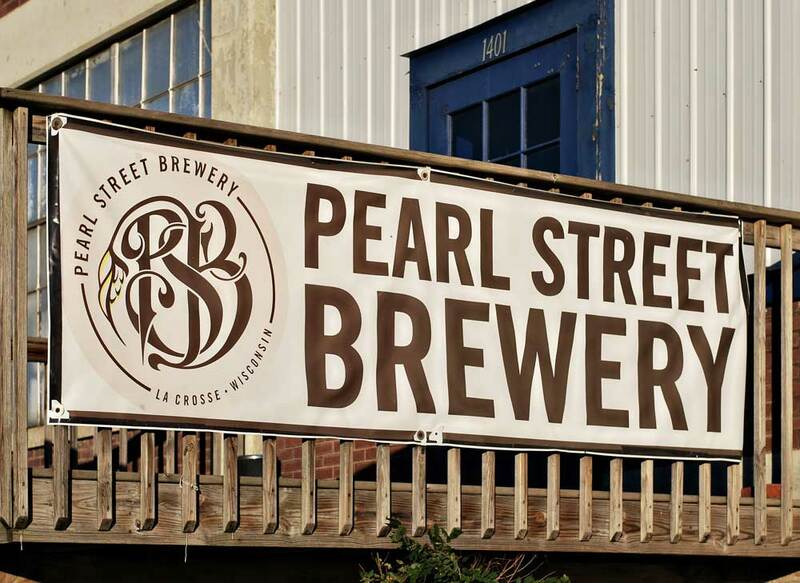 I had a Pearl Street Pale Ale—smooth, full, and easy on the hops, just the way I like it. 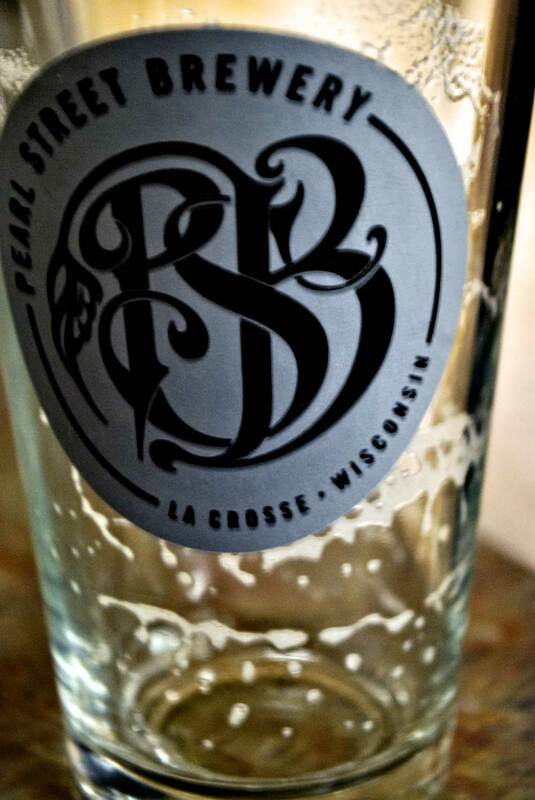 Don’t you just love Pearl Street’s logo? Pearl Street’s version of Oktoberfest is its Lederhosen Lager Fest Bier, a malty and easy-to-drink seasonal. This would have been my first choice, but since it’s already October and most autumn seasonals come out in September, it was no longer on the menu. So one stein for no Octoberfest. But five steins for the styles we sampled! Fun place. I liked the unpretentious atmosphere and that Pearl Street is repurposing an old building. A taproom, or tasting room, typically distinguishes itself from a bar by only serving its own beer. 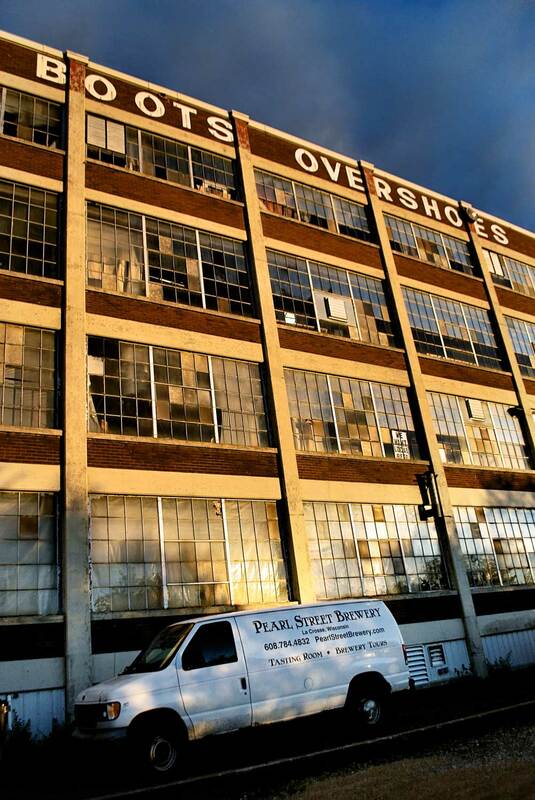 Pearl Street is kind of hard to find, but it’s taproom worth getting to. La Crosse boasts the vibrancy and diversity that comes with being a multi-college town. It makes full use of the Mississippi River for its geographical interest. Think paddle boats, barges, locks and river walks. 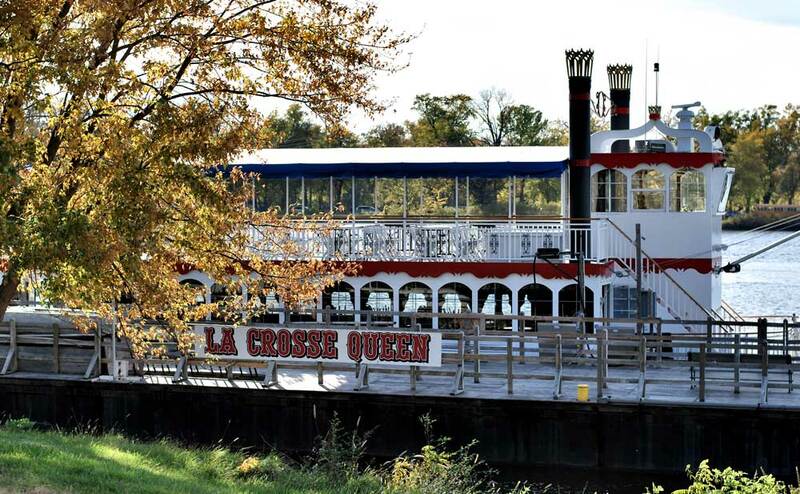 We took a 3-hour lunch cruise on this La Crosse Queen. Super fun! So, I’m forced to automatically deduct one stein because Pearl Street uses that cheesy “are you at least 21 years old?” entry into its website. It was fun, say, 15 years ago, but nowadays it’s outdated and a pain on the smart phone. That aside, I LOVE everything else about Pearl Street’s marketing. The organic, hoppy flow of its logo—be still my heart—makes me swoon! Their website copy is fun, energetic and full of delightful stories. I love their labels. Hey, I love everything they’re putting out (except the website entry). This one I have been too! I visited it when traveling to watch MLC Knights play basketball and I stayed for the weekend – all alone! I bought some Pearl Street and ran a beer tasting at home having been here and learned so much! I’m keeping my eye open for Pearl Street beer here. A taste test at home…there you go! Thanks for making the stop in. Your article was fun to read and we really appreciate all the feedback! We will have to save you some Oktoberfest Lederhosen Lager 2015! Stop in again anytime. Thanks for the support! Pearl Street Brewery Brew Crew! We’ll definitely be back! Thanks so much!